The first activity in the management of AV nodal—dependent supraventricular tachycardia is to try Valsalva Maneuver and there by blocking AV nodal conduction temporarily. However, the success of the Valsalva Maneuver can be confounded by hypotension and sympathetic activation often present during supraventricular tachycardia. Thus, while the Valsalva maneuver can be a safe, fast, and easy way to stop supraventricular tachycardia, it is oftentimes ineffective. In a controlled, prospective clinical trial performed in the emergency department, 428 participants with supraventricular tachycardia were randomized to a standard semi-recumbent Valsalva maneuver vs a semi-recumbent Valsalva maneuver with passive leg raise immediately after the maneuver. Only 17% of the participants in the standard Valsalva maneuver group achieved a return to sinus rhythm, whereas 43% in the modified Valsalva group did, representing a highly significant difference, with an adjusted odds ratio of 3.7 in favor of the novel Valsalva approach. 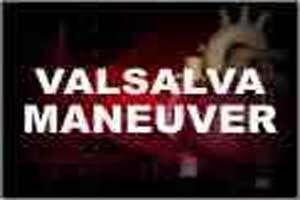 This simple adjunct to the Valsalva maneuver has become a “GAME CHANGER” regarding the acute management of supraventricular tachycardias. This approach can be used safely and more effectively in the emergency department to stop episodic supraventricular tachycardia without the need for adenosine or other interventions, but it may be useful even outside the hospital setting.